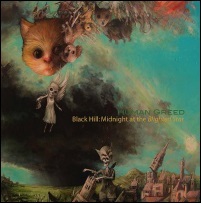 Black Hill: Midnight at the Blighted Star is the third release from Human Greed, a Scottish based project founded by writer Michael Begg and featuring the artist/illustrator Deryk Thomas. Michael Begg has been part of Fovea Hex, while Deryk Thomas is perhaps better known for his bunnie paintings that appear on the sleeves of Swans and Angels of Light releases. Black Hill: Midnight at the Blighted Star additionally features the musicians Julia Kent (Antony and the Johnsons), Clodagh Simonds (Fovea Hex), and Fabrizio Modonese Palumbo (Larsen, Blind Cave Salamander) who along with David Tibet (Current 93) offer short spoken verse. The abstract electronic compositions of Black Hill: Midnight at the Blighted Star ooze disquiet as it lulls and swells through the course of 15 tracks. It's a recording of menacing intent fashioned from feint melodic droning, shrill effects and pulse-like and shuddering drones, mixed with stark guitar notes, orchestral touches, stolen found sound and lyrical fragments. On 'Gloaming' graceful and gliding cello chords, performed by Julia Kent, cut deep swathes of melody through flickers of electronics. The shadowy electronics and wispy wails of 'Internal Moment' takes on a haunted dreamscape presence, before slipping into the slow arching drones of 'Silver Coin' where disembodied chiming organ notes are bookended by the slow, spoken treated voice of Fabrizio Modonese Palumbo. There's a distinct haunted air to Clodagh Simonds' piano playing: brittle notes tap out a skeletal melody over distant chatter on 'Examination', while the closing track, 'The Graces Departing', features a ghostlike sombre melody. Black Hill: Midnight at the Blighted Star takes on vestiges of the nocturnal, especially on 'Dalkieth Night' which contrasts the mundane example of council scheme kids recounting their nights on the piss with a curt poetic snippet of stars, moons, clouds spoken by David Tibet (of Current 93). The children's laughter that punctuates the brooding drone of 'Portrait of God with Broken Toys' reads like a comment on the flawed and falling humanity.